I'm delighted to welcome one of my favorite small-town contemporary romance authors to TRD! I first discovered Debbie in 2010 (writing as Debbie Mazzuca) when I fell in love with her debut, a Scottish historical paranormal romance titled Lord of the Isles. 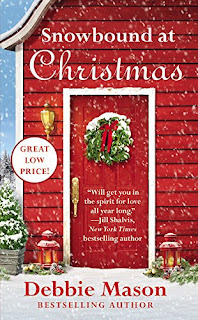 Two years ago, she changed her pen name to Debbie Mason and her writing to contemporary romance, introducing readers to the lively residents of the mountain town of Christmas, Colorado with the release of The Trouble With Christmas. That first book was all it took to reel me into this quaint town with its heartwarming stories, occasional danger, and cast of quirky characters. Five books later, I still look forward to each new story with joyful anticipation. Today, Debbie is bringing us a new scene from Christmas, written just for us, starring the lead characters from her new book, Snowbound at Christmas. Thank you, Debbie! Cat walked toward the man sitting in front of the outdoor brick fireplace. Grayson turned his head and gave her a smile that made her knees weak and her heart flutter. "How long do you think we have before they figure out we're not there?" he asked, as she settled in the chair beside him. She spread the blanket over them and glanced at the kitchen window. "Ten minutes, if we're lucky." "We better make the most of it then," he said, opening his hand to reveal a sprig of mistletoe. He waggled his eyebrows and held it over their heads. She laughed and curved her hand around his neck, drawing his mouth to hers. "I like the way--"
"Time for the birthday cake, you two. You can go back to canoodling later." Nell's voice cut through the cold night air. Grayson groaned against Cat's lips. "That wasn't even ten seconds." Cat felt like groaning too, but she didn't want to miss her niece's reaction to her first birthday cake. "Leave everything here. We'll come back as soon we're done. Promise," she said when Grayson gave her a skeptical look. The first thing Cat noticed as they walked into the great room was the bearskin rug in front of the floor-to-ceiling fireplace. Her sister-in-law Skye was an animal rights activist. With today's excitement, they hadn't had time to hide the rug when her brother and his family arrived at the ranch. They'd taken turns sitting on it to keep it concealed, but someone had obviously fallen down on the job. Thankfully, Skye was nowhere in sight. Cat, with Grayson in tow, made a beeline for the rug. She pulled Ty and Annie down with them. Her brother, who was sitting on a wingback chair with Evie on his lap, frowned. Then his eyes went wide when he realized what they were hiding. He opened his mouth but didn't get a chance to say anything because his wife, wearing a sparkly purple dress, lilac wings, and a cupcake tiara on her head, walked into the room carrying a sugar plum cake and singing "Happy Birthday." They all joined in, laughing when Evie squealed with delight and grabbed two fistfuls of cake. Which she promptly tried to shove in her father's mouth. Cat's mother and her stepfather retrieved the cake while Skye attempted to cleanup Evie and Ethan. Grayson leaned into Cat. "Why is she dressed like that?" "She's the Sugar Plum Cake Fairy." "Of course she is," he said, looking like he thought he'd fallen down the rabbit's hole. "Madison came up with the idea. She's a silent partner in the Sugar Plum Bakery. Grace's cake is pretty famous now," Cat explained. "Because it comes with its own fairy?" he asked with a glint of amusement in his pale-blue eyes. "No, because the wishes in the chocolate sugarplum come true. Maybe you'll get one," she said, nodding at the piece of cake her mother had just handed him. "Other than some time alone with you tonight, I got my wish, love." She kissed the underside of his stubbled jaw. "Me too." "Make mine a big one, Mommsy," Chloe called from where she sat between Nell and Easton on the couch. "I want to increase my chances for a sugarplum wish." Easton cast a nervous glance at Chloe, no doubt concerned he was the reason her sister wanted a wish. Nell must have been as nervous as Easton because, a few minutes later, she nudged Chloe and whispered in her ear. As soon as Chloe turned her head, Nell switched her piece of cake with Chloe's. "Would you look at that, I got a chocolate sugarplum," Nell announced seconds later. Chloe looked at her plate and frowned. "My piece of cake shrunk." She narrowed her eyes at Nell who was opening the sugarplum. The older woman pulled out a thin strip of paper. "What does it say, Aunt Nell?" Cat's stepfather, Paul McBride, asked. Lips pursed, Nell cast Chloe a sidelong glance. "That my match has been made in heaven, and I'll get my happy-ever-after very soon." Chloe released a disheartened sigh, then went back to her cake. A moment later she cried, "I've got one too!" Both Nell's and Easton's panicked gazes shot to Chloe. Her sister frowned as she read her sugarplum wish. "I think Grace made a mistake. This is a birthday wish for someone named PJ." Everyone was trying to figure out who PJ was when Nell snapped her fingers. "I know a PJ. Debbie talks about her all the time," she said, referring to the co-author for her Christmas, Colorado romance series. "Says she's one of the sweetest ladies she's ever met. Besides me, of course. PJ has a romance review blog, the Romance Dish, and always has nice things to say about our town and you kids. But I thought her birthday was in September, so it's a little late . . . Wait a minute, Cat and Grayson's book is releasing next September. We can--"
"Am I ever going to get a book, Nell?" Chloe asked. Nell ignored her. "Come on, everybody. Let's take a picture for PJ by the tree. We'll send it along with a copy of Snowbound at Christmas." Ethan widened his eyes at Grayson and Cat, nodding at the rug. Grayson dug in his pocket, pulled out the sprig of mistletoe, and tossed it to her brother. While Ethan distracted his wife with a kiss, Grayson and Cat scooped up the bearskin rug. When they returned from throwing it out the patio doors, Annie, Ty, and Lily were kneeling on the floor making a sign. Her sister was hunting through the presents under the tree. Cat walked over to Chloe. "What are you doing?" "I bought Evie a fur coat for Christmas," she whispered, then stood up as everyone crowded around the tree. She brightened. "I'll put your name on the card instead of mine. Skye will forgive you. She likes you better." Before Cat had a chance to respond, Nell held up her cell phone and made a face. "We need one of those selfie sticks." "I have one," Chloe said and started to walk to away. "Of course you do," Easton muttered. Anxious to get back to canoodling with the man she loved, Cat grabbed her sister's gold lame top and reeled her in. "Let's just take the picture." They all squeezed together and smiled for the camera while Annie and Lily held up a sign that read Happy Birthday, PJ! Nell snapped the picture. She had to take three more before Chloe was satisfied with how she looked. When everyone finally began moving away from the tree, Cat grabbed Grayson's hand. They sprinted for the mudroom and headed outside, then stopped short. Her mother and Paul were sitting in their chairs, kissing under the mistletoe. Grayson looked down at her, then leaned back and opened the door. "Hey everybody, NORAD just announced that Santa's flying over Colorado. Come on out and see if we can spot him." Once they were all gathered outside looking up at the night sky, Grayson pulled Cat inside and locked the door behind them. Awww... Thank you, Debbie! That was awesome! Readers, want to read more about Cat and Grayson's story? Pick up a copy of Snowbound at Christmas (out Sept. 29th)! Do you enjoy reading Christmas-themed romances? When do you start reading them? Do you wait until December or (like me) dive in as soon as they're released? Have you read Debbie Mason's Christmas, Colorado books yet? Do you have a favorite story? I confess, I love them all! If you were lucky enough to get the chocolate sugarplum in one of Grace's cakes, what would you want the wish to say? I love Christmas reads & look forward to them coming out. I generally start reading about this time. I think I'd like the wish to say something about peace on earth. We need all the good wishes we can muster. That's a good wish, Mary! Hope you enjoy Snowbound at Christmas as much as I did! I love the town Christmas. I've only read two of the books but I'm definitely going to catch up.I read Christmas books usually when they start coming out unless they are books that have been out . I'll red them whenever. You have lots of great stories to look forward to, Carol! I really enjoy reading Christmas romances. It is a yearly tradition for me to start reading them sometime in November. I love Christmas stories and start reading them around October and I have read Debbie's series. If I got the plum, would wish for good health for my family and friends and world peace. I know it may be corny, but what is more important that that. I think it's a lovely wish. I think that's a wonderful wish! Looking forward to welcoming you tomorrow, Vanessa! I'll add my wish for your husband as well. I love the Hallmark Christmas movies! Normally I start reading them after Halloween or when the first flakes fly but I have made exceptions for authors that are on my auto buy list. Unfortunately, I have not read Debbie Mason's books as yet. So many wishes but my husband was laid off and we really need for him to find a job or me for that matter but I've been out of the work force for 30 yrs. So many people are in the same position, catslady. Adding my wishes to your own! Christmas books are captivating and special. I love any of Debbie Mason's memorable novels. Christmas themed books give me hope. I would wish for a life filled with happiness but mostly great health. Christmas themed books give me hope. I like that. They do, don't they? I enjoy reading Christmas starting in the fall into New Years. Unfortunately I have never had the pleasure of reading any of Debbie's books. I really enjoyed Debbie's story and with them wishing you a happy birthday, PJ. If I could make a wish I would wish for world peace and health for my family and friends. Glad you enjoyed the scene, Cathy! I think that reading romances set during Christmas is just part of the seasonal joy, though I also love to read them in the heat of summer when I sometimes wish for snow. This is a new to me author and I enjoyed the brief story shared here. If I were lucky enough to get a chocolate sugarplum from the cake, I would wish it to say "Your retirement fund will grow phenomenally through the years and you will retire in contentment with plenty of time to read and funds to keep your habits." That's a great wish and, I'm sure, one we would all like to have come true! I do like Christmas books; and ususally start reading them in November. I have not read any of Debbi'es books. Do you enjoy reading Christmas-themed romances? yes. When do you start reading them? as soon as they are released. Have you read Debbie Mason's Christmas, Colorado books yet? yes. Do you have a favorite story? like all of her books. If I got the plum, I would wish for good health for my family and friends. Hope you enjoy Debbie's new one, Emma! This is such a cute series! I can't wait for the new one next week. I usually start reading Christmas books as soon as it starts getting cooler, and that cannot come any time too soon. I agree, Nikki! I'm more than ready for cool weather this year. I'm really enjoying all the stories written for your birthday, PJ! Thanks for the birthday gifts to us! I read and enjoyed Christmas in July last year. 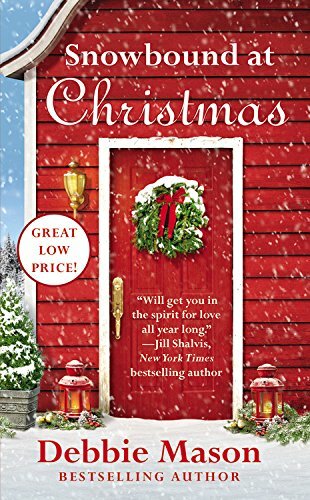 The last few years, I've celebrated "Christmas in July" by reading a couple of Christmas-themed books while Hallmark was running holiday movies and introducing this year's ornaments. Otherwise, I start reading Christmas-themed romances at Thanksgiving and continue until January. I'll start buying them when as they are released and this year I may be tempted to read one or two early. I like your Christmas in July reading tradition. I think I need to adopt that! Hope you enjoy the ones you do read. I'm always happy to read Christmas themed books anytime of the year!! Wedding Bells at Christmas was the first book I read by Debbie. I enjoyed it so much I had to go back to read the others. So that is my favorite. I tend to read Christmas books in November, December and January. If I were lucky enough to get a chocolate sugarplum cake, I would wish for good health for people in my family. I loved Vivi and Chance! If their book is your favorite then you'll enjoy their scenes in next week's Snowbound at Christmas. I do enjoy reading stories set at Christmas! Especially as we move into the fall. I remember reading the Harlequin Christmas anthologies many years ago - I still pull them out to re-read them. I do too, Di. Some of those Harlequin Historical holiday anthologies contained stories that are on my all-time Christmas favorites list. I love reading stories with a Christmas setting. I'll read them all through the year. Thanks for visiting, Debbie. I've been known to pull a few out at other times of the year when I need that Christmas lift. I absolutely like to track down new Christmas themed books this time of year. The perfect time to start reading them is before the actual craziness of the holidays arrives and helps set the mood for the holidays! Looks like a fun read! They do set the mood, don't they? Last year, I set aside an hour every evening during December to read holiday stories. I love to read Christmas novels - any time from now thru January. I have not read Debbie's books, but will have to give them a try. If I got the plum, would have to say joy, good health to all. Oh it sounds so good and perfect for a holiday read! These are my favorites to read around Christmas and always bring such holiday spirit! Christmas and romance always go together! I cannot wait to read! I have loved reading this series!! !